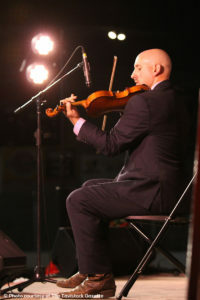 Canadian Grand Master Fiddle Champion Paul Lemelin, from Sudbury Ontario Canada, has been playing the fiddle since the age of 4 and has been competing at various contests since the age of 8. At home Paul works as an Electronic Technologist for Vale Exploration. He enjoys teaching the fiddle, guitar, mandolin and piano as well as being a father of 3 young boys and a young daughter. Paul is also the President of the “Fiddleworks/Violon à l’œuvre” organization in Chelmsford Ontario, the host of the “Northern Ontario Fiddle and Stepdance Championship”. Paul has won a number of competitions including first place in the Open category in Sturgeon Falls Ontario, Chelmsford Ontario, Richmond,Ontario as well as three wins in Pembroke Ontario, arguably the biggest fiddle contest in Ontario. Paul was first invited to compete at the Canadian Grand Masters in 2006 and has since received the honour of being invited to compete every year since 2010. The highlight of Paul’s career came in 2014 when he won the CGM earning him the Title of Canadian Grand Masters Fiddle Champion, followed by a back to back/weekend to weekend win in Pembroke Ontario, a feat only achieved 3 times prior in the history of both contests! Recently Paul has been playing with various Bluegrass bands and is now part of a group called “Nickelwound”. Paul previously taught at AlgomaTrad 2008 and we are looking forward to having him and his family back again.